Liz Harris BSc (Hons), PgDip AM, EBW, CBW – registered with the MAA, BCMA and the IEBWA. Liz has always been devoted to the welfare of animals and has ridden since childhood. This love of animals, coupled with an interest in the benefits of complementary medicine, has led her to undertake a career in natural animal therapy. 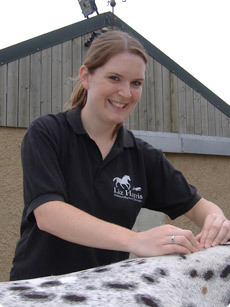 Liz graduated from the University of the West of England (Hartpury College) with BSc (Hons) in Equine Science in 2003. She then undertook a 2-year postgraduate course at McTimoney College (University of Wales) and in 2006 she graduated with a PgDip Animal Manipulation. In the summer of 2006 Liz undertook two intensive massage courses run by Equinenergy, and became the area’s first practitioner holding both the Equine Body Worker and Canine Body Worker qualifications. Liz is a member of the McTimoney Animal Association, the British Complementary Medicine Association and the International Equine Body Workers Association, and is fully insured. While at University, Liz passed British Horse Society Stages One and Two in both Riding and Horse Care, and obtained a certificate in Basic Animal Nursing. She has experience working in a variety of equine establishments, including an equine therapy centre, a dressage yard, livery yards, a Thoroughbred stud, a hunting / dealer's yard and several riding schools. Liz always works alongside your veterinary surgeon and other professionals, such as your saddler, farrier, behaviourist and/or equine dentist, in order to provide the best possible care for your animal. Based in Skeeby, Richmond, Liz regularly travels throughout North Yorkshire, Darlington, County Durham and the surrounding area. Visits to areas further away may be negotiable – please contact Liz for further information. Treatments for your horse or dog are available at Northallerton Equestrian Centre. Contact Liz to request a treatment for your animal.